A World of Many Hats and Not Enough Shoes - We loved her good today, didn't we? We loved her good today, didn't we? I remember being at a couple's conference when I heard this phrase come from the speaker's mouth. He was using it in explaining how God knows how to love us best and we can ask God to help us to show love to our spouse in those little ways that speak directly to their souls. He told how he got this gift for his wife that was truly God inspired and only He could've known how much this gift would mean to her. Afterwards, when he was thanking God, he prayed, "We loved her good today, didn't we?" I feel like that statement is so true for me today and God loved me good through not only my spouse, but though the sweetest girls. This morning I was kidnapped, blindfolded, carried into a van and driven around for half an hour. On my birthday, Josh and I had a heart-to-heart about my garden and it came down to I had to be ready to give it up if this whole foot thing went sour. 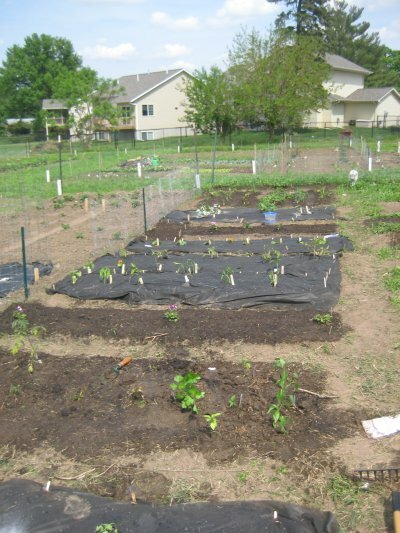 Since that chat, I got to the garden only twice to weed the cold weather crops (both times having Josh drop the kids and I off to play and work for hours) but I could tell I was going to be hard pressed to get any warm weather crops. Planting new crops means not only gathering all the seedlings from the store but preparing the beds, weeding the beds, planting the plants and watering them in AND watering them every day for the first 7 days... and for me that also meant doing all with crutches and a foot I can't walk or drive on. I never expressed my desires to anyone and in my mind I kept trying to figure a way I could rope people into helping, maybe my parents when they come up, maybe Josh on his day off, maybe if we just... my ideas were endless but none were working. The sweetest girls joined forces (and conspired with Josh) and pulled off the unthinkable. They gathered seedlings and soaked seeds, hoes and rakes, bagels and cream cheese, gatorade and water, balloons and banners, sweat and sunburns. My birthday surprise was they were going to prepare my beds and plant my warm weather crops for me. No joke. They gave me a (decaf) latte and a comfy chair and a foot rest and told me to boss them around (though I did convince them to let me plant my beans!). They had bought all the plants I needed, of all the right kinds and some being beautiful, homegrown, heirloom tomato plants from a friend's mom! The 7-6 girls worked in the hot sun for over 4 hours and weeded and laughed and planted. They turned my weed covered beds into a thing of beauty (And to top it off, they are even going to water it every day for the first week). Wow. I don't know if they fully understand it or not, but God truly used them to speak to my soul today. "We loved her good today, didn't we?" Yes, you did. Response to We loved her good today, didn't we? This is so touching and wonderful, Dana! I'm so happy for you and so thankful for your husband and your friends!!! What a wonderful birthday present! Aww friend! I would do it again in a heartbeat! I had so much fun.. and I am glad it worked out, I was getting nervous for short time.. You should have seen me talking to Amber the night before.. and playing out all the what if's :) I was praying in the car as I drove to your house that God would just be in it, and it would all work out.. and all of what you said makes me smile so much! What a great gift Dana! It's neat to see God blessing your soul in a way that couldn't have happened without your foot going sour.